On my sidebar I recently added an image and link to the flickr page for the Bushfire Quilt Project, a group quilting effort begun by Tia of Camp Follower Bags and Quilts. 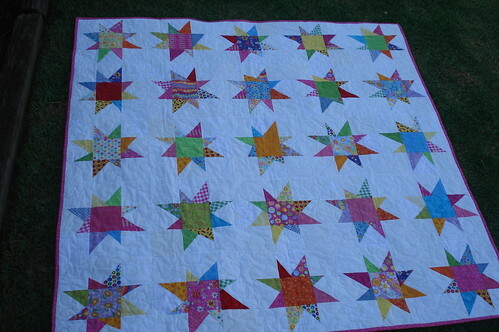 Tia is collecting scrappy stars to create quilts for the victims of the bushfires in Australia. I understand she was originally hoping to collect a few stars to make a few quilts ... yeah, that's not happening ... check out the flickr group and see how many have already been produced! She has enlisted her quilting group for help and I can't wait to see how many quilts they complete when all is said and done. Above are the squares I've created. My intention was to make stars that were a little more masculine, just to add a little variety. This was a really fun task, and a great way to use up scraps. 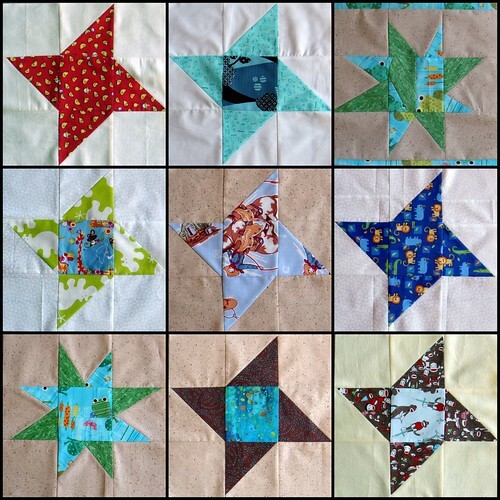 There is no right or wrong way to make the stars, so there's no need for a beginning quilter to wonder if they are qualified to craft these gifts ... they are. And really, one block or ten ... it doesn't matter, all are welcome and appreciated. If you've got a few minutes and some spare fabric please consider creating a star or two for the project! Below is an example of a completed quilt (some quilters are sending already completed quilts ... awesome, isn't it?) created by quiltcraft. Isn't it wonderful? great blocks! wow...this quilt is stunning! i'm so thrilled by the response. i hope tia isn't too overwhelmed! !